In my own mind, I have always thought of the Parable of the Prodigal Son (Luke 15:11-32) as “the great parable.” Over the years I have taught the parable to seminary students; I have discussed it with Bible study groups in church basements and parish halls; I have explored it with ordained clergy. Sometimes I have used great art – often the work of Rembrandt – to help us enter the narrative. At other times, I have led participants in the making of their own images of the story. I have also learned that this parable, perhaps because it is set within a family, has a way of intersecting with real lives. It sometimes provokes disagreement, even anger. But for me it remains one of the most powerful means of understanding God’s limitless capacity for forgiveness. I was, therefore, immensely pleased to receive a commission to create a sculpture depicting this parable for the Duke Divinity School’s 2005 addition in Durham, North Carolina. Old Testament professor Ellen F. Davis had introduced me to the school’s Dean, theologian L. Gregory Jones. He selected the subject for the sculpture after discovering that he and I shared a long-time interest in the parable. His book Embodying Forgiveness reproduces on the cover Rembrandt’s 1642 drawing of the reunion of the father with the prodigal. 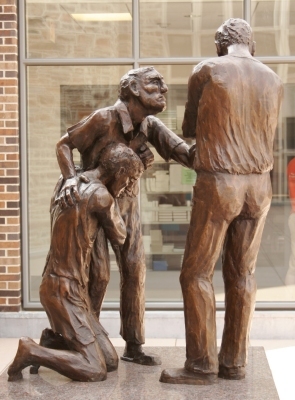 Moreover, Dean Jones felt that a sculpture on this parable would be emblematic of the Divinity School’s work on reconciliation. The 2005 addition to the Duke Divinity School includes a Center for Reconciliation. With the subject chosen, I began to work with the Arts Committee, an advisory group comprised of Divinity School faculty, administrators, staff, and a chaplain. I was the first artist they worked with. I feel strongly that any commission should be a collaborative effort, with the artist and the commissioning institution working together to achieve a result which will be satisfying to both. We began our work together accordingly by reading the parable and discussing it. It is a challenge to take any extended story – this is the longest of the biblical parables – and depict it in a single work of art. Where a filmmaker or choreographer is able to present the complete narrative, a sculptor can “tell” only one part of the story. For instance, we might have chosen to depict the prodigal’s initial demand for his patrimony, his “coming to himself” among the pigs, or his journey home. But the committee and I agreed that while all of these scenes are essential to the tale, the events at the end – scenes involving prodigal, father, and older brother – serve best to summarize the meaning of the whole. Based on our discussions, I proposed to make five small plaster “sketches” representing different ways of depicting the parable’s ending. I returned with the sketches 6 months later. These offered variations on the reunion of prodigal and father, with the older brother included in some of the sketches. In one sketch, for instance, the older brother viewed the reunion of father and prodigal from a position on the far side of a doorway. Interestingly the committee’s first choice was the sketch, which I had hoped they would choose and I took this as an indication that the committee and I were working well together. The sketch was a response to a comment by Andrew T.P. Merrow, the rector of my home parish (St. Mary’s in Arlington, Virginia), that the father was the bridge between the two brothers: I showed the father embracing the prodigal, but turning to reach out to the older brother. This version conflates the two scenes at the end of the parable, but all of us agreed that it best captured our understanding of the story. My task now was to “blow up” the sketch to the size of the final sculpture: 48”, 2/3-life size. I spent more than four months, from early summer into mid fall, 2004, constructing the full-scale plaster model. This involved building an armature of pipes and wood and wire mesh which would serve as a skeleton to support successive layers of plaster. I work in plaster for my larger sculptures because it hardens quickly and I like the surface that results when I carve back into the hard plaster with rasps and knives. I have to be careful, however, and never let the plaster dry out. This is never a problem during working hours, since I am constantly using water to wash away shavings. However, at night I need to wrap the sculpture in wet towels and plastic sheeting in order to keep it wet. Moving from a small sketch to a much larger model always necessitates changes. In this case, some of the changes were substantial and I found the older brother was particularly difficult. I had to replace his left leg five times and his head three times! This kind of surgery is not simple when the sculpture is in plaster. Each time I changed the leg I had to chip away the plaster, cut out the wire mesh, and saw through the armature to remove the offending leg before rebuilding it. In the final sculpture, the left leg is at a completely different angle from the leg in the sketch. In fact, his whole stance is more truculent. (I am tempted to conclude that this was the result of my struggle with the figure.) Fortunately the father and prodigal were more accommodating and I was able to finish the plaster model just as the weather began to turn too cold to work with plaster in the outdoor studio where I sculpt. 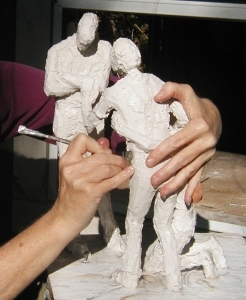 The process of casting in bronze is very complex and labour-intensive, entailing a series of molds and casts. Working from the full-scale plaster model, the foundry fabricates a reusable latex-and-plaster mold. Next, a replica in wax is cast from this mold. 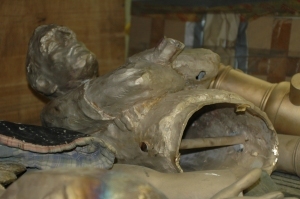 If the sculpture is large, as in this case, the wax cast is cut into pieces and each piece covered with a mold of silica. The silica molds are fired, turning the silica to ceramic and causing the wax to evaporate. This is origin of the term “lost wax”. Now molten bronze is poured into the ceramic molds. The bronze hardens quickly and the ceramic molds are then knocked off the bronze. The pieces must then be welded together and then the reassembled bronze sandblasted to even out the surface in preparation for patination. This involves heating the bronze and spraying it with acids, which turn the metal different colours. In the case of Reconciliation, I chose a patina that holds up well outdoors. 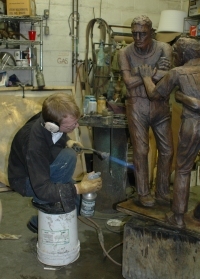 The bronze is turned black with acid, scrubbed down to reveal the highlights of the bronze, and sprayed with layers of acid to turn it brown. The brown warms the sculpture and softens the contrast between highlights and shadow areas. A coat of wax seals the patina and protects it, although this wax must be reapplied yearly. 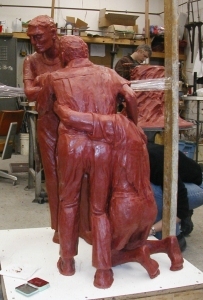 Reconciliation was cast at the New Arts Foundry in Baltimore, Maryland. I have worked with this foundry for years and they are generous with their time and expertise, and in their willingness to allow artist participation. I customarily visit the foundry to check the wax and sign it, and return to supervise the patination. 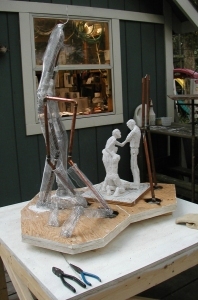 I think of these trips as another instance of collaboration on the way to the completed sculpture. 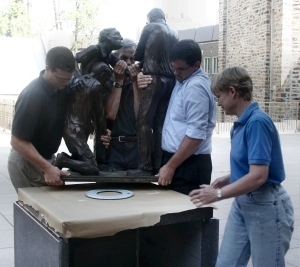 Setting the sculpture was a potentially complicated decision, since the 2005 Addition at Duke Divinity School includes not only a new chapel, new classrooms, office spaces, a book story, and a refectory, but also the Duke Institute for Care at the End of Life, and the Center for Reconciliation. However, the Arts Committee wanted the sculpture placed outside, which immediately narrowed the choices. They ultimately decided to position the sculpture on a second-floor outdoor terrace. The space is adjacent to the new refectory and bookstore; it is visible from several classrooms as well as from a glass-paned hallway running the length of the terrace; students can use the terrace to relax at lunch or between classes; and the school also holds receptions there. This placement would set the sculpture at the center of many of the Divinity School’s activities. However, there was still the question of the exact spot on the terrace where the sculpture should be placed. In making this decision we were working without the sculpture, which was still in fabrication at the foundry. Therefore, we positioned staff members – standing in for the sculpture – in various spots on the terrace while others checked the lines of sight from a number of angles. Once the spot was determined, I was able to design the base and begin to consider how the sculpture should be oriented on the base. This final decision was in some ways the most complex of all. The sculpture, with three figures interacting, presents many interesting points of view. We needed to anticipate from which places most people would view the sculpture and then decide which views we would want them to see. I tried to work this out in my studio, positioning the small sketch on top of plans for the terrace and surrounding buildings, but it was ultimately clear that the final decision would have to wait for the actual installation. Fortunately, the foundry in preparing the sculpture for transport from Baltimore to Durham had bolted the bronze feet to a slab of 1 3/4” plywood. For the installation I brought along a metal “lazy Susan” turntable on the off chance we could set it under the plywood and that it would support the weight (almost 300 pounds) of the sculpture. Amazingly, it worked – we were able to turn the sculpture slowly and assess each position. Pictures taken at the installation show this final consultation – members of the Arts Committee; Divinity School staff, faculty, and students; workers from the granite company; and the Duke University architect are standing around watching as the sculpture is turned. Afterwards all that remained was to drill the holes for bolting the sculpture to the base and to do a final touch-up on the wax. It is pleasing to me to think that this commission ended, as it began, as a collaborative effort. 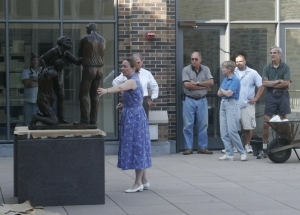 The sculpture titled Reconciliation was dedicated in August 2005 at the Opening Convocation of the 2005/06 academic year. Dean Jones preached the opening sermon of the year, taking Luke 15 as his text and speaking about the sculpture as well. This was the first of a series of 14 sermons – one preached on the text connected with each of the new works of art. My view is that this preaching series was an inspired way to sum up the work that went into the art commissions. Moreover, the sermons served as a means to explain the new art in the common “language” of the Duke Divinity School community. Margaret Adams Parker works as a sculptor and a printmaker. She is also an adjunct instructor at Virginia Theological Seminary in Alexandria, VA, where she teaches about the connections between religion and the visual arts. She writes and lectures widely on religion and the visual arts. Parker’s sculpture of Mary has been installed at St. Mary’s Episcopal Church in Arlington, VA; in the chapel at the Cathedral College at Washington’s National Cathedral; at St. John’s, West Hartford, CT; at The Episcopal Church of St. Mary the Virgin in San Francisco, CA; and at Iglesia Santa Maria in Arlington, VA. The full-scale model for the sculpture is in the library at VTS. She created twenty woodcuts to accompany a new translation by Ellen F. Davis of the Book of Ruth: Who Are You, My Daughter? Reading Ruth through Image and Text (Westminster John Knox Press, Louisville, 2003.) The Library of Congress purchased Women, a set of 15 woodcuts. The United Nations High Commissioner for Refugees reproduced Parker’s 2-color woodcut, African Exodus, as the frontispiece to Refugee Children, Volume 23 (Number 2, 2004) of Refugee Survey Quarterly, published by Oxford University Press. She has also just completed a 10-year project: a set of woodcuts of the Stations of the Cross.